This set is a real treat, and an unmissable bargain to boot. 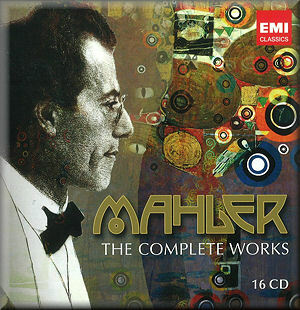 Having already released both Rattle’s and Tennstedt’s Mahler cycles at budget price, EMI have gone even further to commemorate the Mahler anniversary by raiding the archives and providing what is, effectively, a treasure trove of the finest Mahler conductors and singers on their books. We have highlights from Rattle and Tennstedt but also remarkable contributions from Klemperer, Barbirolli, Horenstein, Szell and even Furtwängler. Add in the super bargain price (less than £3 per disc) and this set is irresistible, even before you consider the superlative quality of what is on offer. Simon Rattle’s Mahler series turned a lot of heads as it was being released and we are treated to three highlights here. His Third is a reading of strength and authority - just listen to the awesome power of the opening movement - combined with moments of great tenderness and lyrical beauty. It was also something of a game-changer in interpretations of the Nietzsche movement, playing the oboe calls as glissandi rather than distinct notes, something nearly all subsequent recordings have observed. The singing of Birgit Remmert is heartfelt and intense, while the chorus brim with life in the fifth movement. The finale moves to an incandescent climax meditating on the love of God, though the sudden accelerando will put some off. Unusually the conductor chose his live recording of the Seventh over his studio version for release. In my view the acoustic of the Snape Maltings doesn’t flatter the CBSO but the clarity of the reading, even in the finale, is beyond doubt. The texture and palette of both Nachtmusik movements is delectable. The Tenth is Rattle’s later, Berlin version, by common consent the finest reading of this work available, and certainly superior to Rattle’s own Bournemouth recording. The playing of the Berlin strings, for one thing, is on a much higher level than Bournemouth’s. Rattle carries a searing vision that is lacking from Chailly’s account. Rattle’s contributions form the backbone of this compilation and it merely underlines one’s awareness of this conductor’s strength as a Mahlerian. Tennstedt’s set is EMI’s other staple in this repertoire, though for the Fifth EMI have wisely chosen his live version of 1988, a vast improvement on his heavy, lethargic studio recording. The first movement unfolds with sure pacing and superb playing while the vehemence of the second movement is tempered with surprising lightness of rhythm so that parts of the movement sound like a demonic dance of death. The conductor undermines the scherzo’s exuberance with a touch of sarcasm at the outset and the Adagietto is intense and hushed - literally so: I had to adjust the volume at the outset and was then taken aback at the big climax. The finale scampers along with vigour, the re-emergence of the brass chorale the obvious culmination, and the audience erupt into deserved applause at the end. Others have waxed lyrical about the virtues of Tennstedt’s Eighth but I’ve never been one of them. I love to immerse myself in the overt theatricality of Solti and the closing bars of Tennstedt’s version sound underplayed and weak to my ears. Listening to it again, however, I was struck anew by just how musical a version this is: where Solti took the score by storm Tennstedt looked for hidden depths and microscopic detail, helped by a team of soloists who revel in every note and an engineering team that do their best to expose every facet. The payoff of the final bars isn’t quite enough to satisfy me, but taken holistically this remains a highly satisfying performance. Klemperer’s Mahler performances have everywhere the distinctive imprimatur of authority, considering his direct link with the composer. His Resurrection is one of his finest performances, surprisingly fleet of foot, but only in the Urlicht does it feel rushed. The ensemble is not always ideally together but the listener is never in any doubt that a master is at the helm. The first movement crackles with intensity, driven by stabs of energy that stick out of the texture. The second movement exudes poise and, yes, charm, with a wonderful string sound, and Klemperer even finds wit and humour in the Scherzo. The finale carries immense power in the approach to the throne of God and the chorus sing magnificently from their barely audible entry to the blazing climax, though Schwarzkopf’s contribution to the solo singing is noticeably more characterful than Rössl-Majdan’s. Klemperer’s Das Lied von der Erde did a lot to open up the whole interpretative spectrum of this work, contrasting Bruno Walter’s introspection with this conductor’s harder-edged drive. The conductor does indeed take us on an intense journey into the soul, but his soloists are what sets this account apart as extra-specially great. Wunderlich’s molten tenor glows in this music, summoning grandeur and intensity for the first movement but finding a comic touch for The Drunkard in Spring. Christa Ludwig is at her absolute peak here. Only Ferrier and Fassbaender could challenge her supremacy in this music, parts of the Farewell becoming almost unbearably intense, and the final few minutes summon up the best from both conductor and singer. The remastered sound is very good too, allowing me to give this Lied the highest recommendation. EMI have also done a great job of raiding the archives for this set and unearthing some high quality novelties. Horenstein’s Fourth is as recommendable a version as you are likely to find. Throughout he captures just the right mix of the innocent and the sinister, most notably in the joky but devilish scherzo which leaps along with a sneer on its face. The first movement is light-hearted with just the right element of Schwung and the third is soft and intense until the “heaven’s gates” climax where the full force of the orchestra is unleashed. Dame Margaret Price sounds very adult in the finale, no hint of childishness, but her voice is still very beautiful and both soloist and conductor have the measure and pace of this movement entirely. Barbirolli’s Ninth is at the head of many recordings of this symphony to come from Berlin, and it was the recording with which I first got to know this work. Listening to it again after many years it has lost none of its power. The hand of a master shapes the unfolding of the great Andante comodo, though the ultimate climax is not quite as total as you can hear elsewhere. The Ländler comes across initially as highly comic but this expression curdles into a sinister leer as the movement progresses. The Rondo Burleske has had few performances on disc that are just so well played, while the sheer warmth of the string sound in the great theme of the finale will take your breath away. The closing pages are especially heartbreaking, the conductor conveying wonderfully the sense of a life ebbing slowly away. This is a performance to cherish. The same can’t be said for Barbirolli’s Sixth, however. He has an awesome grip of the vast scale of the finale - listen for the way the music intensifies after each hammer-blow - and the slow movement (positioned second) sounds very beautiful. However the first movement and scherzo are much too slow and lumpen with no energico about them at all. This drains the music of its power and makes it unrecommendable, not helped by the persistent grunts the microphones pick up from the podium. Barbirolli also ignores the first movement exposition repeat. The only out-and-out disappointment among the symphonies, however, is Giulini’s heavy First which is much too controlled, lacking drama and passion. The conductor is too measured and aristocratic in this music and is unwilling to let the players off the leash so that the big climaxes are curiously underplayed. The finale, in particular, lacks energy so that there is little sense of a developing journey, though Giulini shows surprising affinity for the klezmer elements of the third movement. Elsewhere Rattle’s Klagende Lied has had to contend with stiff competition from Chailly on Decca, but in Rattle’s hands we hear the cantata as not only a pre-echo of the mature composer but as a fairly astonishing work in itself: what ordinary student could produce such marvellous orchestral sonorities? Chorus and soloists are excellent, with an especially noteworthy contribution from Robert Tear. For the other song cycles EMI offer us tremendous variety and quality. The early Lieder und Gesänge are extremely well sung, with humour and wit sitting alongside heartfelt passion. The set includes three songs specially recorded for this set by Antonio Pappano and Ian Bostridge, and when you see that the other songs include the likes of Christa Ludwig, Katarina Karnéus (especially beautiful) and Brigitte Fassbaender you know that you are in safe hands. Elsewhere Furtwängler directs a predictably weighty account of the Gesellen lieder with the young Fischer-Dieskau wringing every ounce of meaning out of the words, conveying white-hot intensity in the third song and a poignant sense of loss in the finale. Szell’s 1968 account of the Wunderhorn songs is still the finest you will hear anywhere. The singing is above praise and the vocal acting is so compelling that each song feels like a miniature opera. And what a treat to have Kathleen Ferrier’s untouchable account of the Kindertotenlieder! When it was recorded in 1949 this performance set standards that every other recording of the cycle has sought to live up to and the dark intensity of Ferrier’s voice is perfectly suited to this music. Ferrier’s natural successor, however, was surely Dame Janet Baker, and her 1969 account of the Rückert-Lieder acts as a wonderful counter-balance to Ferrier, coming immediately after the Kindertotenlieder on the same disc. It is with the Rückert-Lieder that EMI choose to end the whole set: we get Thomas Hampson’s (slightly pallid) account of the piano version and then - a collector’s treat, this - seven contrasting accounts of the final song, Ich bin der Welt abhanden gekommen, in a huge range of interpretations and accompaniments which only serve to highlight the wonderful mood of this song. I leave it to the listener to decide which account is the finest: it’s a difficult choice. Full credit to EMI for commemorating the composer’s anniversary in this way: they have appealed to both newcomers and established collectors by providing the complete works at a super bargain price and have given us a cook’s tour of great Mahler conducting at the same time. Full texts and translations are provided as a PDF on the final CD. For what it’s worth, I think that this set trumps the similar offer of the complete works from DG: the DG is also full of quality but EMI have been more imaginative in choosing their performances and the overall standard is higher here. Snap up this outstanding bargain while it is available: it may not be around for long. Digital remastering (P) 2001 by EMI Records Ltd.
Digital remastering (P) 2004 by EMI Records Ltd.
Digital remastering (P) 2000 by EMI Records Ltd.
Digital remastering (P) 1991 by EMI Records Ltd.
Digital remastering (P) 2005 by EMI Records Ltd.
Digital remastering (P) 1983 by EMI Records Ltd.
Digital remastering (P) 1998 by EMI Records Ltd.
Digital remastering (P) 1999 by EMI Records Ltd.
Digital remastering (P) 1996 by EMI Records Ltd.
Digital remastering (P) 2002 by EMI Records Ltd.
Digital remastering (P) 2010 by EMI Records Ltd.
Digital remastering (P) 1988 by EMI Records Ltd.